An afghan has quietly been creating itself along in the background all year this year. (Well, not exactly on its own, it has been relying on me to be quietly knitting along on the component scarves amongst all the other knitting this year). We first met the afghan in all its glory in April - Anyone got cable! scarf-ghan though sneak peaks had made it into the blog before that.But I haven't really posted about it since then and lots of progress has been made. In fact its an almost functional couch blanket now. It's time for round two. I have made 4 more scarves since. Then of course the new yarn didn’t match colourwise. 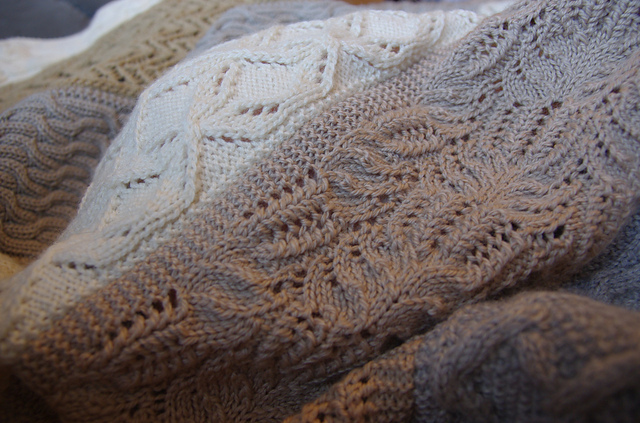 I knitted about half a pattern repeat but it offended my sensibilities. The colour change was that dramatic! So frogged the lot on 1st June 2014. I bought two more balls and began again in the new cream machinewash. This was now going to be the June strip! That was probably a little ambitious. Actually I cast this back on on the 22rd of August! I was finishing up all the the other WIPs (Two jumpers for various children being the biggest of them). And it was finally completed on 15th September. The irony was that after blocking this ended up about 2 pattern repeats too long so in early October I frogged a bit of it and redid the garter stitch edge so it fitted with the rest of the strips. This scarf should just be very happy that I am persistent in the face of adversity. I had a cold and everything else I was working on is too complicated for my brain to cope with. Cables again - waving cables interlocking gently. This was me being productive whilst coping with the saga of scarf number five (see above). This was smooth sailing in comparison. 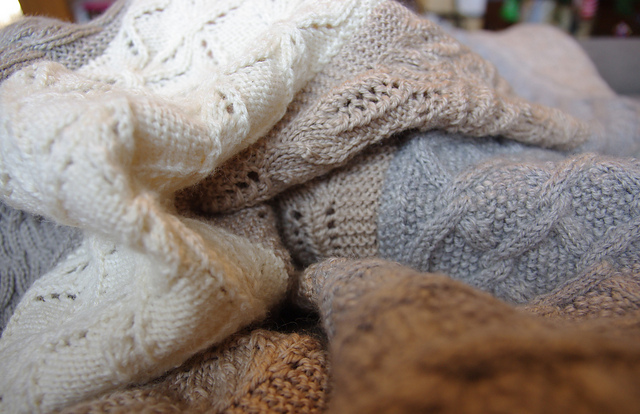 And the yarn is a dream to knit. (Pity I think it's discontinued). Yarn: Panda Woolblend Crepe 8 ply, Gray, 3 and a little bit 50g balls. 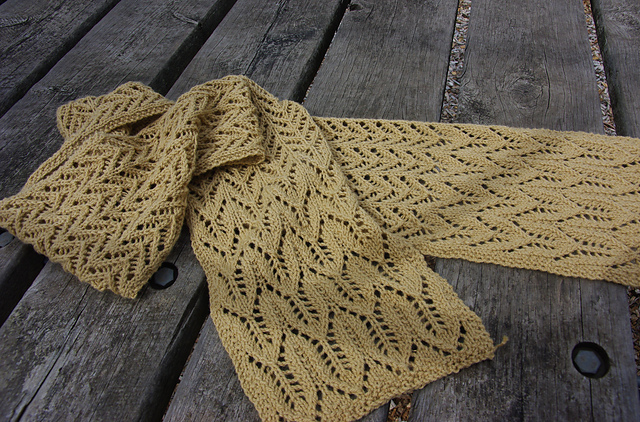 This one is based on Eagle Feathers - a free scarf pattern with a series of different patterned bands beginning with simple chevrons and morphing through to full feathers. I started with a provisional cast on as it is worked out from each end. This was true stash busting. The yarn I used had a somewhat checkered past. 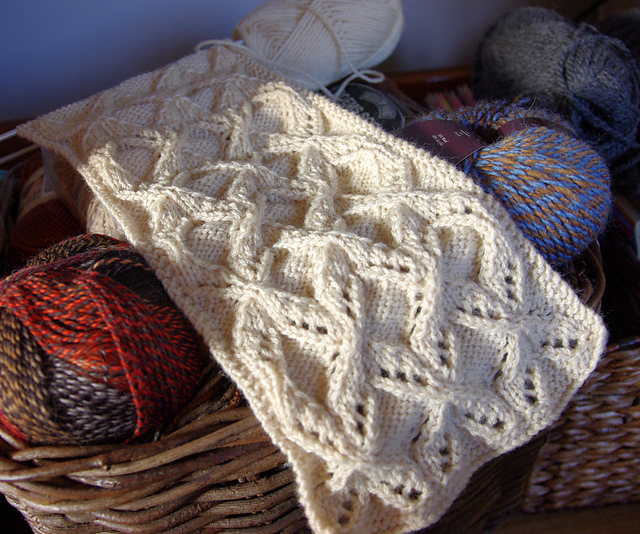 I was reusing the yarn from Arundel which I had frogged during the Ravellenics. I had some some fun (not!) unpicking the provisional cast on and getting the correct amount of stitches to work the other way. 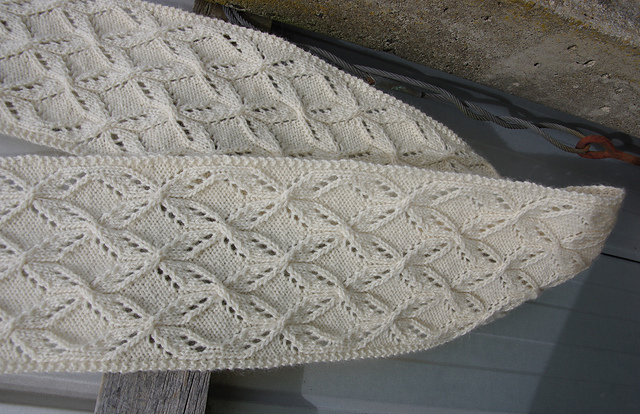 This was a really fun pattern to knit and I especially love the feathers section on each of the edges. Unfortunately it ended up too long after blocking. 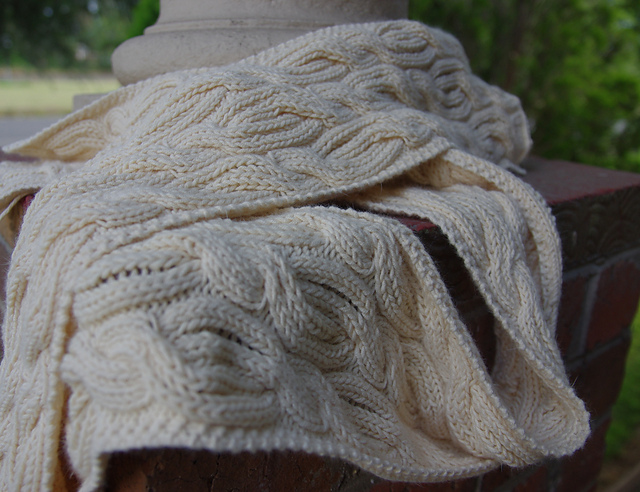 It’s always hard to judge just how much a lace pattern will open up. So I took off one pattern repeat on each end and redid the moss stitch borders. Earlier this year I discovered the delights of dropping stitches on purpose (See Curly Wurly). I was eager to try this again. 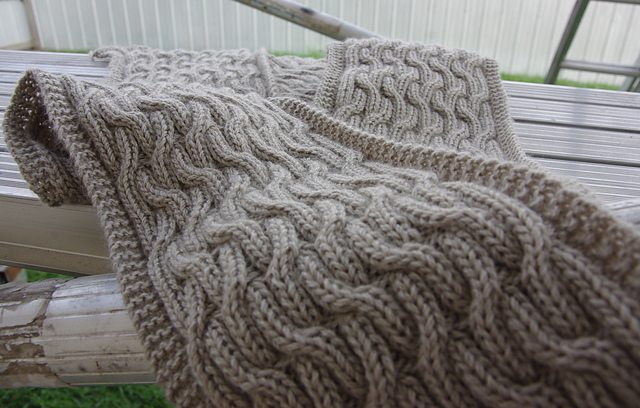 This was slated to be a cable scarf again. 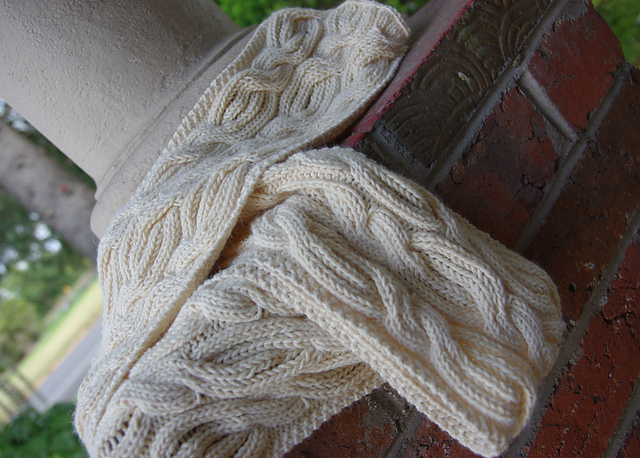 This pattern is a combination of cable and dropped stitches - the very definition of fun. It’s awesome to drop stitches on purpose. The yarn is some cream 12% angora, 48% viscose and 40% acrylic in a buttery cream colour I bought for $2 a ball in an end of season sale. So this something I actually bought purposely this year with this rug in mind. 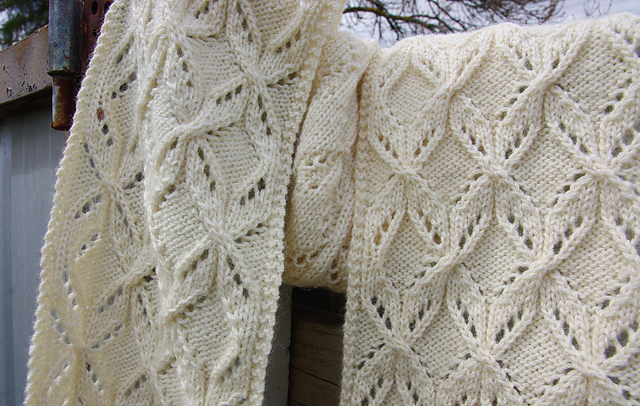 Pattern: Beaumonde by SmarieK Knits. 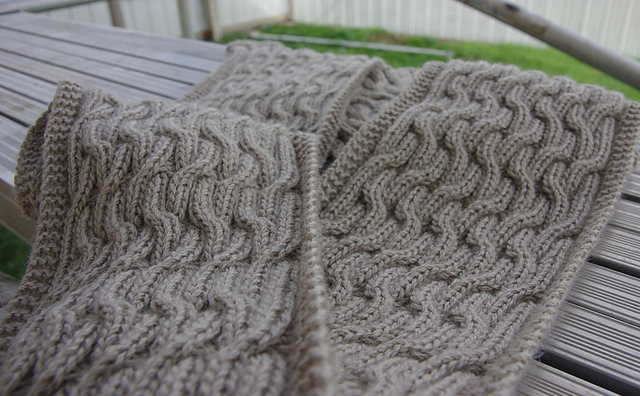 (She has an awesome collection of free cable scarf patterns available. 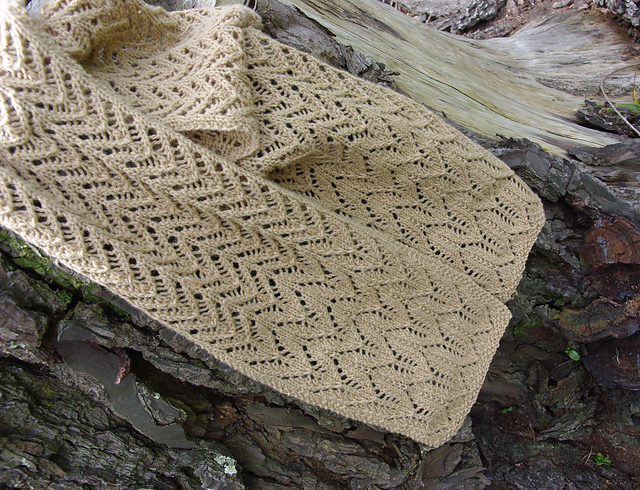 This is the second one I have used as part of this scarf-ghan). I decided to bite the bullet at the beginning of December and sew what I had completed up in order to decide how many more scarves I needed to make to ge the width I want. 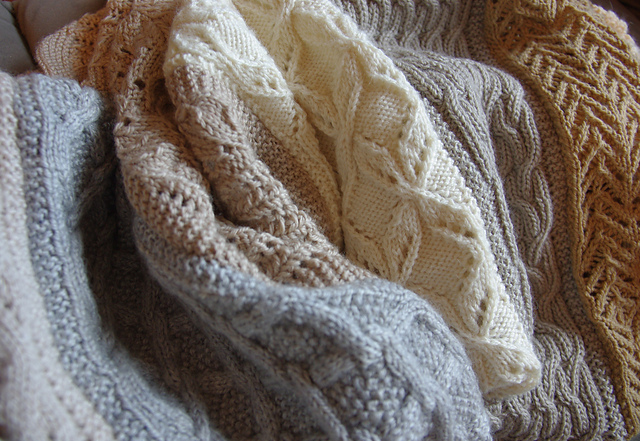 This process took most of a week using my ususual evening knitting time to painstaking stitch the scarves together. What a lovely way to build a rug! I love cables, so this is just soooooo interesting and lovely. Well done! Thanks Kerry. It is a fun and non-overwhelming way to make an afghan... I think I may have to make another one.